Every good orator, lecturer, lawyer, author, composer and teacher knows: You have to start with impact and end with impact. If you are really good at your craft, you also know that what you say or write or compose must have internal consistency. You cannot contradict what you have stated at the beginning or end. A good example of this principle comes from the world of music. Almost everyone is familiar with Beethoven's fifth symphony and its powerful but unsettling opening notes. This opening motif is written in C-Minor, creating the "storm clouds" that give the composition its emotional impact. Everything that follows is magnificently woven into and integrated with that opening theme. It is a masterpiece with no note out of place -- everything belongs and works together. The pure genius is reflected even more in the ending. Beethoven resolves the whole angst of the work when he modulates the key to C-Major. It is as if the storm clouds have parted and the human hope and spirit triumphs having garnered wisdom from the journey. The first golden key to understanding not just Jyotish shastra (precepts and principles) but of all the works in the Vedic tradition is exactly the above principle. Shastra will state something at the beginning of the work or a chapter or a group of verses, and that statement should cause the alert reader to sit up and take notice. It is the signal that this is a seminal idea that carries great weight. The same careful observance should be given to the ending statement. Those who scan through a chapter or book and never get to the close will likely miss the emphasis and priority the sage who authored the work intends. It is important to remember that shastra is written in Sanskrit and in a script that does not have italics, underlining, capitalization etc. Emphasis had to be created in other ways. If we are not "initiated" into the ways emphasis is structured in shastra, we are impoverished in our ability to understand and utilize it properly. Unfortunately, this is often the state of Vedic Astrology as it is practiced in the West. (See Part I: Understanding Shastra from the October/November 2006 issue). All too often, the importance of the root principles as signaled by the golden keys of understanding the structure of shastra is not reflected in the interpretations of the charts. A couple of examples will be helpful to clarify this idea. All shastra in the Jyotish tradition opens with an invocation. The deity may vary but an acknowledgment of the divine source is invariably there at the outset. If we check out the end of these works, we also find the same. This is a flat out statement that Jyotish is a divine subject whose purpose is to help relieve human suffering. Anyone who states that Vedic Astrology is simply "mundane" or just "predictive" misses the boat entirely. Understanding what is a priority principle or idea, as indicated by its placement at the beginning or end of a work or section, is critical to proper chart interpretation. In Brihat Parashara Hora Shastra, a work that is considered to be the root material for Jyotish, the sage gives us the names of the planets following the brief opening two chapters on the origin and cosmology of the world. As soon as Parashara states their names, he immediately gives a shloka defining which ones are the natural benefics and which are the natural malefics. In "modern" Jyotish, it has become the trend to emphasize a concept known as functional benefics and functional malefics. A particular planet is categorized as benefic or malefic not based on its inherent nature but rather based on the particular rising sign or constellation under consideration. Where does Parashara explain this concept of functional benefics and malefics? Depending on what edition of this work one owns, it is somewhere around chapter 34! Without knowing this first golden key, a Jyotishi could be haphazard about what they primarily use as a benefic or malefic in chart interpretation. Unfortunately, that is the case not only in the chart readings but in the books and teachings by primarily Western Jyotishis who do not have direct access to the oral tradition and Sanskrit. A concrete chart example of the difference this could make in an interpretation should drive the importance of this principle home. Here is the chart of Christopher Reeve, the muscular actor who played Superman in his 20's, and died in a weakened condition a few years after a spinal injury in his 40's. Note the beautiful Venus in his fourth house which is in its own rashi of Libra and also has directional strength (dig bala). It is forming a powerful Malavya Yoga (beauty, arts, wealth, refinement) as well as Raja and Dhana yogas (fame and wealth). In the classification of natural benefics and natural malefics, Venus is a first rate benefic. However, if you consult chapter 34, you will see that Venus is a malefic for a Cancer ascendant. If you prioritize incorrectly, you have no way to explain salient features of his life. It was in his Venus dasha that he rose to dizzying heights of fame through his Superman movies and made his fortune. He was born in a wealthy family with a society mother who was beautiful and was herself well versed in the arts. Furthermore, he had an excellent education at private schools, Cornell University and Julliard -- all shown by the beautiful placement of Venus in his chart. If we consider the chart of Carl Orff (Chart D2), we find a very powerful Mercury in the ascendant with the Sun and a powerful Jupiter. Consulting Parashara, we find that Jupiter is the best of the natural benefics. Mercury is also a natural benefic in this chart as per Parashara's definition and when a strong Jupiter influences Mercury, it elevates its benefic tendencies. 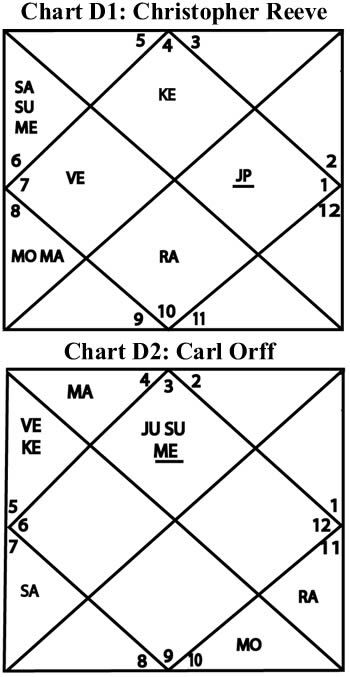 However, if we consult chapter 34, we find that the only auspicious graha for a Gemini ascendant is Venus! Moreover, Jupiter, which powerfully influences the ascendant and ascendant lord, is regarded as a malefic. How can this account for a man who is famed for his music teaching (Jupiter) methods that have influenced countless children (Jupiter) all over the world? He has written and published music and books (Jupiter, Mercury). How can this account for his brilliant career (Jupiter) and the fact that he lived to 87 years old with such a "malefic" Jupiter in his ascendant? Clearly there is a gold mine of information about how to prioritize the material in shastra that one can glean from using this first of the six keys for understanding shastra. Watch for the others in newsletters to come. From the February/March 2007 issue of Michael Laughrin's North American Jyotish Newsletter. Click to subscribe to this free Jyotish newsletter.